Samuel Scudder at Harvard first described this interesting dry meadow skipper, from specimens taken in Massachusetts. Following a tradition begun by his predecessor Thaddeus Harris, he named it for a prominent Native American. ‘Hianna’ refers to the Indian sachem also known as Yanno, who sold the town of Hyannis on Cape Cod to the English settlers (Zirlin, 2005). Dusted Skipper is in a different genus from our dryland Hesperia skippers Leonard’s, Cobweb and Indian, but is found in the same habitats and uses the same host plants (Table A). It has a large southeastern and mid-western range in North America, which our three Hesperias do not have. Unlike the Hesperias it may increase in Massachusetts if climate warms; in fact it has probably already increased since Scudder’s day. At the turn of the century, Scudder termed Dusted Skipper “known from but few localities” in the northeast (1889: 1773). Maynard (1886) considered it “very rare.” Scudder knew of specimens from a few places around Boston – Quincy, Wollaston, Dorchester, and Malden -- and from Springfield. Scudder's 1860's "type specimen" was from Quincy (#15334, n.d., MCZ, collected by Sanborn). F. H. Sprague reported finding eight in Wollaston in June 1878 (Sprague 1879), but these specimens do not appear to be in the Harvard MCZ today. Even though Dusted was not common at the turn of the century, widespread agricultural clearing and forest removal since 1600 had probably increased habitat for it in New England compared to prehistoric times (Table 1). By the 1930’s Farquhar (1934) is able to list more locations for Dusted Skipper: Eastham and Cohasset on Cape Cod in the east (specimens are at Boston University), Amherst and South Hadley in the Connecticut River valley, and Phillipston in north-central Massachusetts. He still considered Dusted Skipper "very rare." It was certainly findable on Cape Cod and in southern Bristol County: W. P. Rogers collected it in Barnstable in 1936, and on Bliffin's Beach in Fall River in 1936, 1944 and 1951 (Yale Peabody Museum). D. T. McCabe found it in Milton Blue Hills in 1948 (specimen at Yale). It was found in Wellesley in 1931 (specimens, MCZ). On Nantucket and Martha's Vineyard, F. M. Jones and C. Kimball (1943) considered it "usually rare," but subject to periodic outbreaks. On Nantucket it was "fairly plentiful in the flower garden" in some years, and on the Vineyard on one occasion it was "taken in numbers on flowers of wild iris." Specimens from both Jones and Kimball are at Boston University, and there are several specimens in the Kimball Collection at the Maria Mitchell Museum on Nantucket. In the 1960’s and 1970’s, collectors were interested in hianna, and reported it whenever they found it. James P. Holmes, working in the Cape Ann area, discovered a local colony at Essex on 12 June, 1966. Edward M. Peters, collecting in the Carlisle area, took specimens in 1970, 1971, and 1972. C. G. Oliver collected it in Acton and Belmont in the 1960's (specimens at Yale). W. D. Winter collected it in Dover in 1973 (MCZ). Darryl Willis said that A. hianna was “common in early June” in the Holliston-Sherborn-Framingham area [probably Sherborn power line] in 1974. And Deane Bowers reported it from Montague in Franklin County in 1976 (Lep. Soc. Seas. Sum. and Correspondence, 1959-1981). There were no reports during this time from Berkshire County, however. Overall, Dusted Skipper was probably increasing in Massachusetts during these years; clearly it was not hard to find. But at the same time, there was a good amount of habitat loss as barrens areas succumbed to development (Table 2). 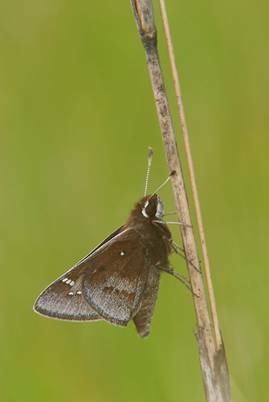 A rare and quite differently-marked form of Dusted Skipper, loammi, occurs in Florida and Mississippi. Most knowledgeable authorities now consider it a separate species (Pelham 2008; Schweitzer, NatureServe 2014). (Cech [2005:302-3] provides photos and identification information for both hianna and loammi, but not separate range maps.) The importance of this for hianna in New England is that all reports of second broods of Dusted Skipper refer to loammi, not hianna; hianna is univoltine throughout its range (NatureServe 2014). Both species seem susceptible to excessive burning; the loammi populations are in serious decline due to development and over-zealous prescribed burning (NatureServe 2014). There is a ‘disjunct’ between the eastern New York and Pennsylvania occurrences of Atrytonopsis hianna and the midwestern populations. Dusted Skipper is very rare around the Great Lakes region, but in the midwest it occurs from Texas north to Minnesota and Canada (BAMONA 2010, Opler and Krizek 1984). As a bluestem grass feeder, it is often thought of as a quintessential ‘prairie’ species, but its status in many midwestern states (that is, in much of the central part of its range) is vulnerable or imperiled (NatureServe 2014). The sole larval hosts are little bluestem (Schizachyrium [Andropogon] scoparium) and big bluestem (Andropogon gerardii) (Scott 1986). NatureServe suggests also Andropogon glomerata in New Jersey. Although all these grasses are native to all counties in Massachusetts (Cullina et al. 2011), little bluestem is the most common and is probably the main host here. Dusted Skipper is one of our “seasonally targeted broomgrass specialists” (Cech 2005), along with the Hesperia species Cobweb, Leonard’s, and Indian Skippers (Table A). Though flying at different times, all of these have little bluestem grass as their main larval host, and have only one flight a year in our climate, important reasons why they are less common than multiple brooded skippers. Dusted, a non-Hesperia skipper, is the only one of these three little bluestem skippers to show any upward trend in sightings over the past two decades. Dusted Skipper's habitat is bluestem grasslands, woods openings in acid pine or pine-oak barrens, and prairie remnants. The ideal habitat is one in which the food plant grass is the dominant grass, intermixed with patches of bare sand or rock (NatureServe 2014). In Massachusetts, stands of little bluestem are often found on rock outcrops and sandy man-made sites, such as old fields, power line swaths, airports, disused railway beds, and even highway edges. Dusted Skipper is often found in such locations, and thus appears tolerant of habitat disturbance as long as its host plant is present. Most of Dusted Skipper’s habitats are naturally subject to fire. Either the immature forms must in some way survive a burn, or the adults must be good colonists. The latter is more likely, since burning appears to have an adverse effect on Dusted Skipper populations in the short term (NatureServe 2014). The larvae over-winter within a tent of leaves sewn together near the base of the host plant; pupation takes place in spring in a sealed case near or on the host plant, 1-3 inches above the ground (Heitzman 1974). Dusted Skipper does not seem as fire-adapted as Cobweb Skipper, whose larvae tunnel underground during the summer fire season. MBC sightings per trip report 1992-2009 (Chart 108) show a strong upward trend for Dusted Skipper since 1995. Similarly, a separate list-length analysis of MBC data by G. Breed et al. (2012) found a statistically significant 50.2% increase in Dusted Skipper between 1992 and 2010. 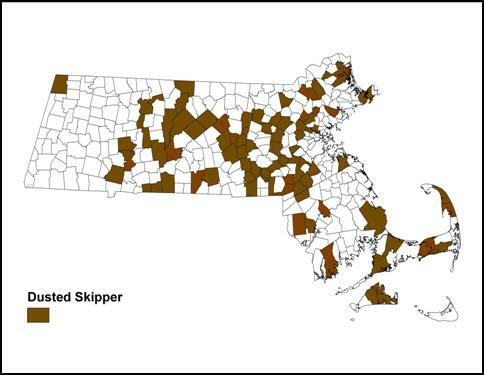 As the Season Summary in Massachusetts Butterflies pointed out, the average number of Dusted Skippers per visit to a location increased 340% in 2007, 169% in 2008, and 123% in 2009 in comparison to the average for the preceding years back to 1994 (Nielsen, Season Summary, MB 2008, 2009, 2010). The number of reports, and the maximum count reported, also increased in each year. Only a few other skippers (Arctic Skipper, Little Glassywing) increased to a comparable extent during those years. The chart readings for 1992 and 1993 depend heavily on single reports of large numbers counted in Foxboro--but there were no reports from Foxboro in the following years. More important, the low number of total reports in 1992 and 1993 may make these two years less comparable to the rest. The results for 1994 forward are more reliable and show the overall upward movement. Yearly fluctuations can often be traced to adverse spring weather events. In 2006, for example, May and early June temperatures were below normal and rainfall higher than normal. Thus, it was a poor year for Cobweb Skippers as well as Dusted Skippers. 2007, 2008 and 2009, on the other hand, were good years for this skipper. Tom Gagnon’s yearly Dusted Skipper counts in Florence, Massachusetts show a similar pattern. Numbers were high in 2004 and 2005, (106 on 5/27/2004 and 71 on 5/29/2005), but none could be found on the comparable date in 2006. But by 2007 and 2008, numbers had bounced right back (96 on 6/1/2007, and 75 on 5/28/2008). Dusted Skipper is found throughout most of the state, except that it is very rare in Berkshire County (Map 108). Between 1992 and 2013, Dusted Skipper was found in 91 of the 351 towns in the state, compared to 57 for Cobweb Skipper. The westernmost towns are Westfield and Northampton. The 1986-90 Atlas had no reports for Berkshire County, nor do there seem to be any historical reports or museum specimens. In BOM-MBC records there is only one report from the Berkshires (Williamstown, Mountain Meadow Preserve, 2, 7/6/2002, P. Weatherbee). There are still no reports from the central and southern Berkshires, or the Berkshire foothills and hill towns. Dusted is found in appropriate habitat throughout the Connecticut River valley, from Westfield Airport area (max. 4 on 5/31/2004 T. Gagnon) in the south to Montague and Turners Falls Airport (max. 4 on 6/21/2003 E. Nielsen) in the north. Annual counts have been made by T. Gagnon in Florence, where the species is plentiful. Recent high counts there are 106 on 5/27/2004, 96 on 6/1/2007, 75 on 5/28/2008, and 110 on 5/22/2010. Dusted Skipper seems less abundant on Cape Cod than one might expect. The most productive location seems to be Falmouth Crane WMA (max. 35, M. Mello et al., 6/11/1998). It has also been reported from Sandwich, Yarmouth, Harwich, Dennis, Wellfleet and Truro in small numbers, often with photos. Dusted Skipper does not fly during the time of the NABA Counts, and may have been missed on Cape Cod for that reason. There are now many reports from Martha’s Vineyard, including from Edgartown (A. Keith), Oak Bluffs and West Tisbury (M. Pelikan), and Manuel Correllus State Forest (J. Holland). While it is no longer rare, as F. M. Jones reported in the 1940's, it does not seem especially plentiful either, and the current Vineyard checklist ranks it as Uncommon (Pelikan 2002). The 1986-90 MAS Atlas had reports from the islands of Nantucket and Cuttyhunk (Gosnold), but there are no more recent reports, and searches are needed. In Bristol County, Dusted Skipper was present at Noquochoke WMA in Dartmouth in 1999 (Mello et al. 1999), but there are few other recent records from that town. Dusted Skipper has been found in parks in fairly urbanized settings; for example Millennium Park, a reconstructed landfill in West Roxbury/Boston, and Mary Cummings Park in Burlington (see below for both). It is found in Hingham at World’s End TTOR (Mello 2003; 6/6/2006 J. Rykken specimens in MCZ), and Wompatuck State Park. The 1980's Atlas had reports from Newton and Needham. Acton Fort Pond Brook, 17 on 6/10/2007 E. Nielsen; Athol pump house, 25 on 5/25/2010 F. Model; Boston Millennium Park, 5 on 6/3/2011 B. Bowker; Foxboro Lamson Road, 27 on 6/1/2007 M. Champagne; Grafton Dauphinais Park, 12 on 6/2/2007 D. Price; Harvard Oxbow NWR, 4 on 6/8/2003 T. Murray; Holliston Brentwood CA, 7 on 6/7/2009 B. Bowker; Hopedale Draper Park, 9 on 6/10/2002; Lexington Cedar Hill and Juniper Hill, 15 on 6/11/2005, T. Whelan; Medford Middlesex Fells, 6 on 6/4/1994 B. Malcolm; Newburyport Little River Nature Trail, 6 on 5/31/2009 B. Zaremba; North Andover Weir Hill TTOR, 10 on 5/30/2009 H. Hoople; Northampton Florence, 110 on 5/22/2010 T. Gagnon and B. Ripley; Plymouth Myles Standish SF, 5 on 6/1/2008 E Nielsen; Raynham Borden Colony, 11 on 5/31/2012, J. Dwelly; Sharon Moose Hill Farm TTOR, 5 on 6/3/2008 M. Champagne; Sherborn power line, 6 on 6/5/2004 E. Nielsen et al. ; Stow Delaney WMA, 12 on 6/6/2005 E. Nielsen; Uxbridge West Hill Dam, 7 on 5/31/1999 T. Dodd; West Tisbury state forest, 6 on 6/1/2007 M. Pelikan; Wellfleet Wellfleet Bay WS, 5 on 5/30/2013, M. Faherty "easy to find on red clover near the buildings"; Westwood Hale Res., 15 on 6/9/2001 E. Nielsen; Woburn Horn Pond Mtn., 5 on 6/4/2011 M. Arey; Worcester Broad Meadow Brook WS, 9 on 6/4/2005 J. Mullen et al. ; Worcester Crow Hill, 20 on 6/8/2007 M. Lynch and S. Carroll. In Massachusetts MBC 1993-2008 sight records indicate a single brood, with a short flight from mid-May to the first week in July. Dusted Skipper is most abundant the last week in May and the first two weeks of June (http://www.naba.org/chapters/nabambc/flight-dates-chart.asp). Earliest sightings: In the 23 years of BOM-MBC records 1991-2013, the six earliest "first sightings" are 5/13/2012 Foxborough Lamson Rd., M. Champagne; 5/13/2010 Northampton Florence, T. Gagnon; 5/15/1999 Uxbridge West Hill Dam, T. and C. Dodd; 5/17/2013 Northampton Florence, T. Gagnon; 5/19/2004 Athol, D. Small; and 5/19/2001 Hingham Wompatuck SP, D. Peacock. Three of these earliest sightings were in recent years; the influence of the particularly warm springs of 2012 and 2010 is apparent. In eight of the 23 years, the first appearance of Dusted Skipper was in the third week of May (5/15-21), while in 15 of the years the first appearance was in the last week of May (5/22-31). A century ago Scudder wrote that Dusted Skipper “appears about 25 May---or perhaps earlier”(1889: 1773). Today's first flight dates are generally earlier than the 25 May. Latest sightings: In the same 23 years the four latest "last sightings" are 7/6/2002 Williamstown, P. Weatherbee; 7/6/1996 Edgartown A. Keith; 7/4/1994 Worcester B. Malcolm; 6/30/2003 Harvard, T. Murray; and 6/29/1995 Wellesley, R. Forster. In only three years has the last sighting been in July; the flight is usually finished by the end of June. Scudder’s last specimens were taken “just past the middle of June,” so today’s flight period seems clearly to be later than that. Dusted Skipper is another example of a southern-based species whose numbers may be increasing in Massachusetts. The species may also be increasing in Connecticut; the 1990-95 Atlas found 41 project records compared to only 26 pre-project records, but was uncertain whether this reflected a range change, or more search effort (O’Donnell et al. 2007: 118). By contrast, Dusted Skipper is assumed to be in decline across much of its mid-western range, because of widespread destruction of natural prairie habitats as well as excessive prescribed burning in prairies (NatureServe 2014). Dusted Skipper seems limited mainly by its univoltine biology and the availability of suitable dry little bluestem-dominant grasslands. Thus it should benefit from preservation and proper management of the same kinds of dry grassy habitats that are needed by Cobweb, Leonard’s, Crossline and Indian Skippers. These habitats are often managed through prescribed burning. But burning likely kills immature forms and it is not known how well Dusted Skipper re-colonizes after a burn, so this grassland management technique should not be used unless adequate unburned areas are left nearby. Frequent burning has been detrimental to Dusted Skipper in other states. This species should be able to withstand and perhaps benefit from climate warming in the northeast (Table 6). Massachusetts is near the present northern known range limit in eastern North America, but the range could move northward. For example, Dusted Skipper had not been reported in Maine at all prior to 2005 (Webster and deMaynadier 2005), but it was recently added to the species list, having been found in three townships during the 2006-2009 Maine Butterfly Survey. It is now a species of Special Concern in Maine (MBS 2014). Similarly in Vermont, there were no historical records, but the 2002-2007 Vermont Butterfly Survey found it in a few locations in southern Vermont.